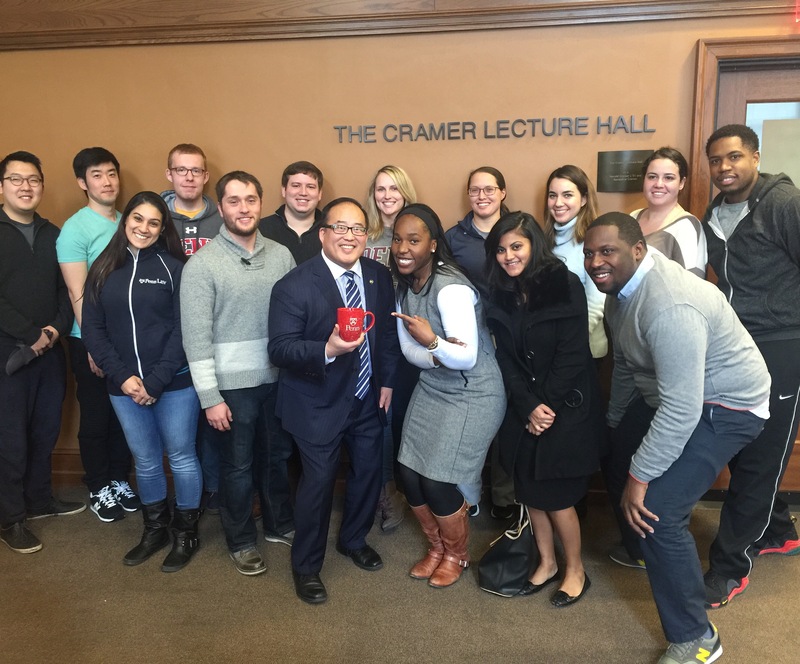 Councilman David Oh (Philadelphia City Councilman At-Large and Minority Whip) visited the Journal of Law and Public Affairs on Friday, February 12th, 2016 to discuss how global opportunities can shape public policy and the lives of Philadelphia residents. 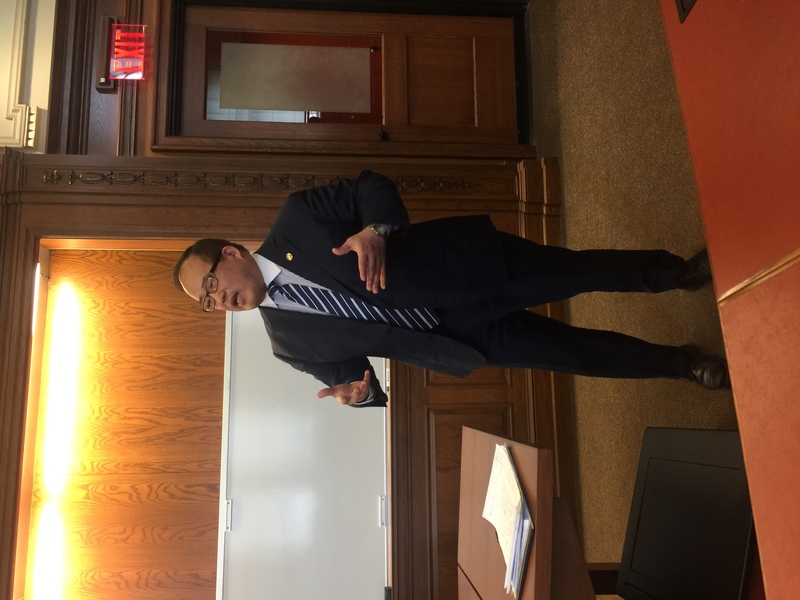 Councilman Oh started the conversation by describing his background in the military, District Attorney’s Office, and his public interest work with community legal aid. He detailed how these experiences shaped his desire to be a Councilman and influenced his outlook on that position. He explained that as an At-Large Councilman, he looks at jobs, public education, crime, and quality of life for the city as a whole rather than for a given area of the city and that his specific mission is to present solutions to the city from an international perspective. Councilman Oh posed the question- “how can we make our city a more global city?” Oh argued that Philadelphia residents cannot realize their whole potential based on what’s located around Philadelphia alone- if we don’t bring international opportunities to the city many may not want to stay in the city and those who don’t want to leave the city may live their lives half fulfilled. Oh said, “it’s important for me to look at the city and say, how can we look at our population, how can we create opportunities for success and happiness in the city?” Oh believes that this message resonated with local residents when put in terms of shipping and trade and the visible impact of sudden job loss that comes when manufacturing jobs shift to other American cities or across the world. Councilman Oh explained how he developed this international focus. He spoke about taking part of international trade missions on behalf of Pennsylvania before he was a councilman to countries like Korea. He emphasized that when working internationally, minute details can become important. For example, there was a significant debate over whether the governor of PA, Tom Ridge, would be picked up in a Mercedes Benz or a Korean-made car during one international trip. He also described the political dynamics of an international trip with a republican governor that was perceived as politically at odds with Bill Clinton. He spoke of dealing with international individuals during his time in legal aid and told stories about working with folks who did not fully grasp American laws and culture. To illustrate how these cultural differences can affect public policy and law generally, Oh compared Korean deal-making which might take several days of social interaction and later contract flexibility with American contracts that are strictly construed. From Oh’s perspective, it is critical to understand these cultural differences if Philadelphia wishes to do business and bring opportunities to the city from emerging markets. 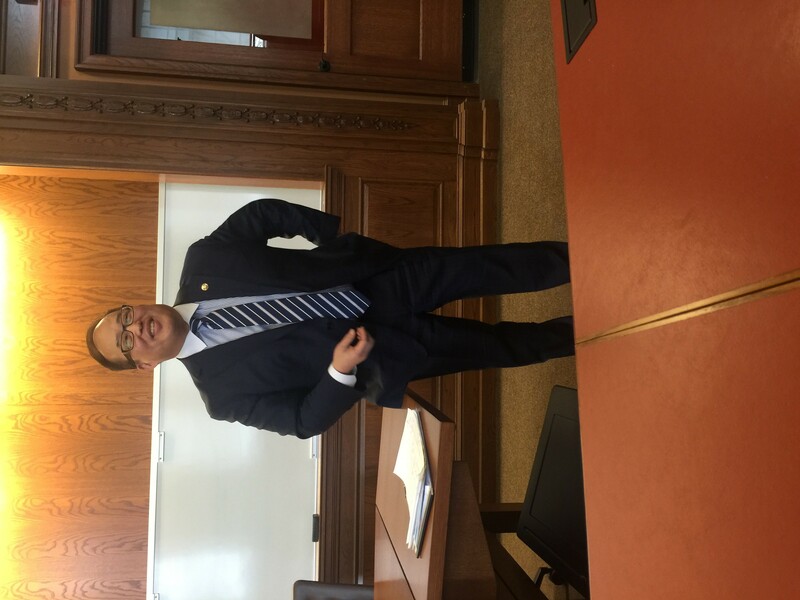 Councilman Oh’s presentation on February 12th was both informative and interesting. While at first glance it may seem like international affairs have little impact on local government, it is clear that is not always the case. Councilman Oh is an advocate for increasing Philadelphia’s interactions with international businesses and governments in an effort to improve the city’s economy and business dealings. However, many citizens feel that working closely with international businesses, while stimulating the city’s economy, is taking jobs from Philadelphia citizens and sending them overseas. Understandably, this leaves people feeling uneasy and unwilling to accept the government’s moves to increase international outreach at the local level. While Councilman Oh’s claim that sometimes the citizens don’t quite understand what is best for them is valid, it is tricky to navigate who should decide what is best for the people if not themselves. In many ways, the people do decide by electing their leaders. If the citizens of Philadelphia feel that an elected official is ignoring the needs of the city in favor of international relations, they will simply fail to re-elect him when the time comes. However, the question arises as to whether his efforts at building international relationships for the city falls into the purview of the job the people elected him for – Councilman. Most people vote for local officials based on very local issues that affect their everyday lives like education for their children and taxes. It is unclear how a candidate’s propensity for entering into international relationships would be considered by voters in a city council election. Aside from concerns about the authority of a council member to act in an international capacity, Councilman Oh mentioned that many citizens vehemently oppose international interaction at the local level. He posited that this was because they do not understand the benefits that building international relationships brings to the city. However, there are various other concerns regarding international interaction at the local level that Councilman Oh did not consider. For example, would Philadelphia’s international relations interfere with diplomacy efforts at the federal level? Also, as he mentioned, certain constituents are worried about the displacement of jobs that may be a result of international interference in the city. Still others raise the concern that Philadelphia has enough domestic issues within the city that the local government should not focus on building an international network and should instead concentrate on issues like education, crime, and infrastructure. These are legitimate concerns that may motivate the people to oppose international relations at the local level. Thankfully, Councilman Oh frequently maintains contact with the citizens, listening to their concerns and educating them on the benefits of building and maintaining international relationships. Ultimately, Councilman Oh’s ambitious international plan is a welcome sign of progress in Philadelphia and an example of an elected representative taking the initiative to improve his city. While the people may have legitimate concerns, they elected him and trusted that he would use his best judgment in their favor, which he has certainly done in bringing international business and economic growth to Philadelphia.